Beam "live" video over your network. 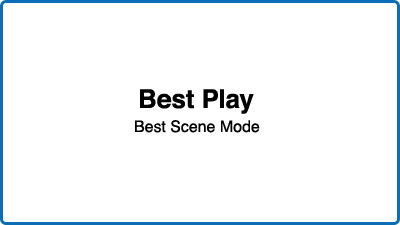 Automatically pick out the best scenes from your footage. Enjoy integrated control from your smartphone or tablet. Serious power you can play with. Plus quality that's no plaything, it's the real thing. 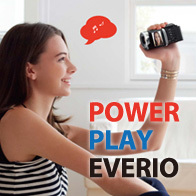 Discover your style of play, with Everio. 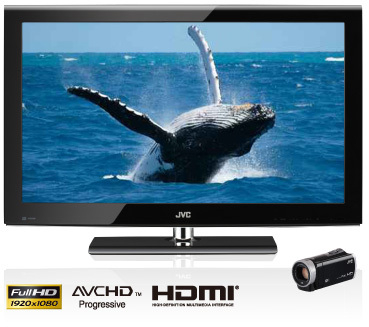 Everio offers Full HD image quality throughout the lineup. You can record native 1920x1080 resolution video regardless of the model you choose. The GX/EX500 Series even offers 1080/50p progressive recording in which each individual frame is a complete, high-resolution picture, allowing capture of blur-less still images from recorded video. All models feature A.I.S. 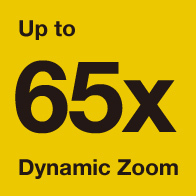 (Advanced Image Stabiliser) technology for effective camera-shake compensation, especially in the wide-angle range. In addition, the high-end EX500 Series and GX/VX Series also offer O.I.S. 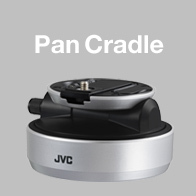 (Optical Image Stabiliser) for pure, lossless compensation in any situation. Everio's Super LoLux ensures superior sensitivity to low light. 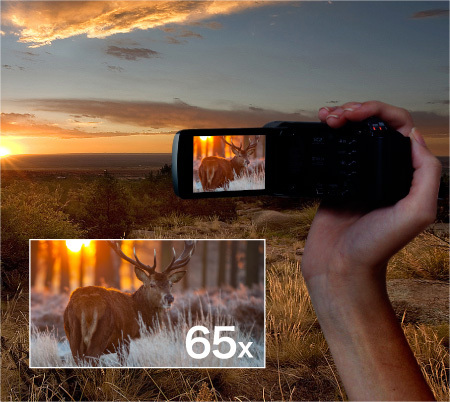 With a Back-illuminated CMOS sensor, you can capture clear images with precise colors even in low light. No worry while indoors or in dark situations. Great for recording landscapes, group shots in cramped quarters, or with the camera pointed at yourself. When fully zoomed out, the angle of vision is equivalent to a 29.3mm lens (EX500 Series) on a 35mm SLR camera (29.4mm for VX Series, 29.5mm for GX Series). 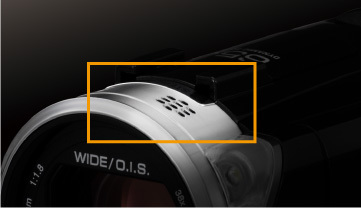 GX/VX Series' lens is F1.2, which is approximately two times brighter and faster than conventional camera lenses. 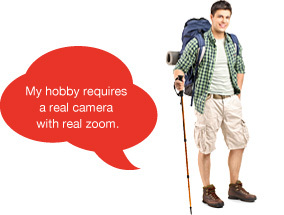 You'll be able to record in low light environments with confidence. Whether indoors or outside in dark situations, capture the moment with brilliant results. High-performance image processing engine enables recording still images at up to 12M-pixel resolution (VX Series) in Ultra Resolution mode. High quality stills with zoom power that digital still cameras and smartphones just can't match (11M for GX Series, 8.3M for others). 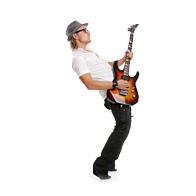 The same audio technology used in recording studios to restore sound elements that are lost during digital compression, assures realistic sound of recorded scenes. 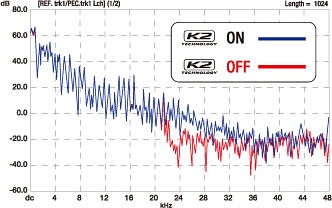 Most models apply K2 during the recording process so it's effective even when playback isn't done at the camcorder. Automatically turns Wind Cut ON and OFF depending on wind conditions using an original algorithm and tuning, so scenes won't sound noisy or unnaturally muted. 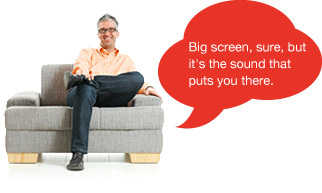 Enjoy up to 2 hours of uninterrupted recording. 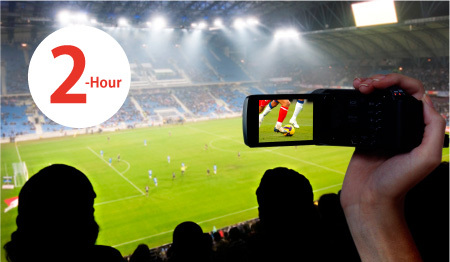 The high-endurance battery also contributes to longer streaming of live video feeds. Either way, Everio goes the distance. Everio E/EX300 Series models offer 40x optical zoom, which is the highest level in the industry. Zoom in subjects that are far away without any picture degradation (38x for EX500 Series, 10x for GX/VX Series). 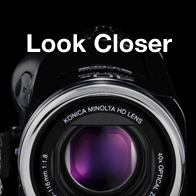 Powerful CMOS maintains HD resolution even when exceeding the optical zoom range. The zooming microphone changes the focal point to match the picture from wide to tele, so you can always hear what you see. Recording starts automatically when a subject is detected, then stops automatically after 5 seconds of no movement. Records one frame at a time at set intervals (1sec. – 80sec.). Watch hour-long movements at a fraction of the time! Manual Stop-Motion recording also possible for your clay animations. Automatically selects the optimal settings wherever you point the camera. Get the best possible shot anytime. Mutes the operation sound and dims the LCD brightness with one button ease. No worry recording in dark and quiet places. Broadcast live over the Internet! 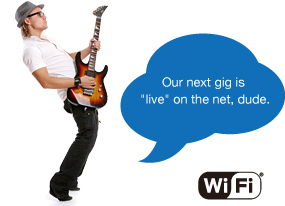 Just use the supplied LoiLoFit for Everio (supplied with Wi-Fi equipped models*) and broadcast "live" over the Internet with Wi-Fi connectivity. 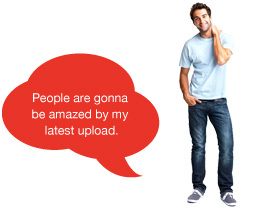 You can share your live feeds through USTREAM and show off your stuff to friends or a global audience. Keep an eye on what's happening via smartphone/tablet! 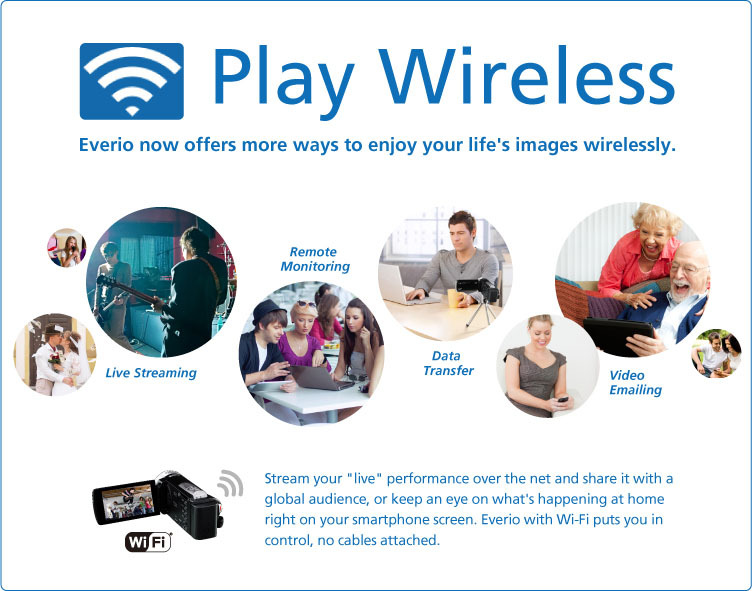 Camera images from Everio can be transmitted to Android phones/tablets, iPhone, iPad, or PCs for real-time monitoring. 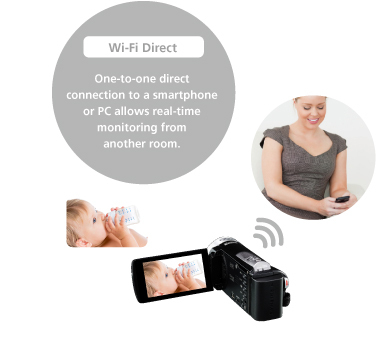 Keep an eye on the baby sleeping in another room, or stay in touch with people miles away via the Internet. 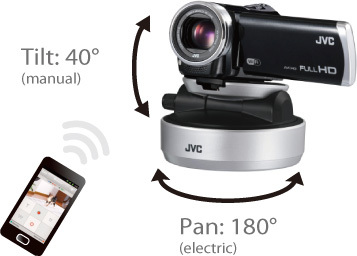 Wirelessly Transfer AVCHD Data to Your Tablet or Smartphone! 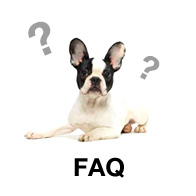 Access your Everio via smartphone or tablet using our free app. 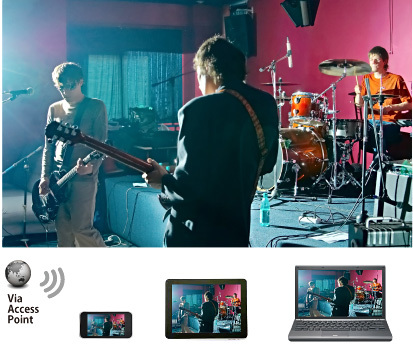 Wirelessly download your recorded HD footage as you like. 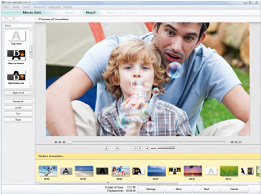 Full HD AVCHD data is automatically converted to widely usable MP4. There's also an iPhone/iPad-compatible iFrame Recording mode, so you can wirelessly download data from Everio directly to your iPhone/iPad and edit it using iMovie. 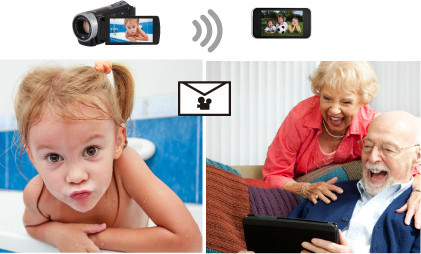 With the Video E-mail mode, you can record a 15-second video clip and have it directly emailed to registered smartphone/computer addresses. 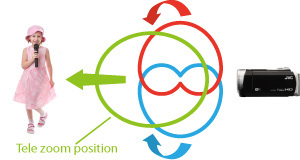 Up to 8 recipients can be pre-set for simultaneous sending. 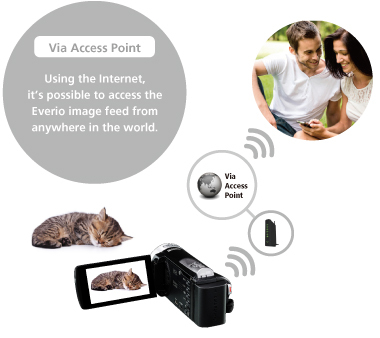 When a subject enters the detecting area, Everio will automatically take a digital still and send it via e-mail to your smartphone or computer. You can check on your loved ones while you're out and about. At the touch of an icon, Everio's data is automatically transferred for backup on a PC. No cable required! This application supports OS2.3 or later for Android, and iOS5.1 or later for iPhone/iPod touch/iPad, however does not constitute a guarantee that all devices using those operating systems can use these application features. Look Around and See What Everio Can Do! New accessory turns Everio into a remote panning home monitoring system! 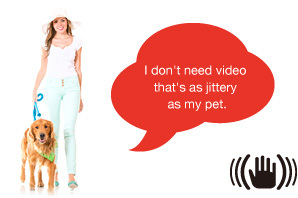 Responds to commands from your smartphone/tablet via Wi-Fi network. Motorised 180° panning operation (+manual 40° tilting). 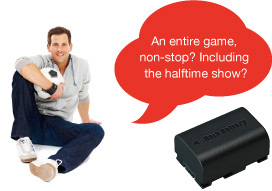 Powered by two "AA"(LR6/HR6) batteries (not included) or supplied AC adaptor. Works with Wi-Fi equipped Everio models (except GZ-GX1). 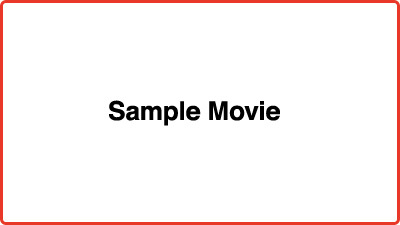 Simple digest playback of only the best scenes from your footage! Just tag the scenes you like during rec or play by tapping on Everio's LCD screen, or via Wi-Fi using your smartphone or tablet (during rec only). 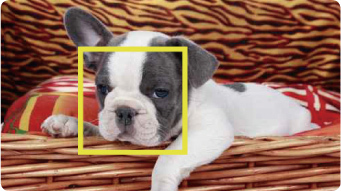 Works with Face Recognition to automatically pick out scenes where registered faces are detected. 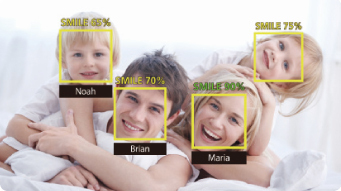 Works with Face Recognition to automatically picks out scenes containing smiles over 70%. 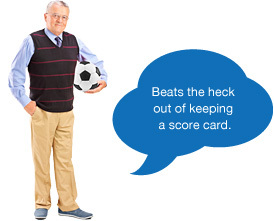 Keep a running tally of the score, like they do on TV! Keep tabs on how the game is progressing. 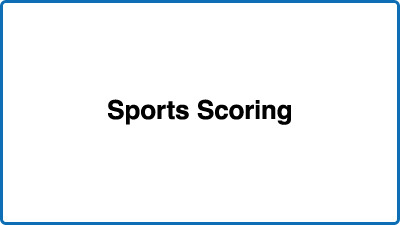 Add points as they are scored, using our free app on your smartphone or tablet, and a Wi-Fi connection. 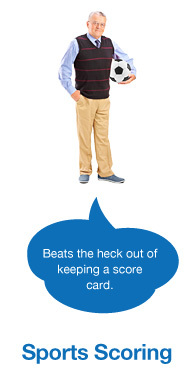 During playback you'll know exactly how the home and visiting teams are doing. 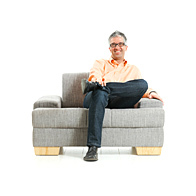 The Smile Meter keeps an eye on how much your subjects are smiling, giving you a % display. With Smile Shot, the camera automatically captures a still image upon detection of a smile. It's a great way to take group shots filled with smiling faces. 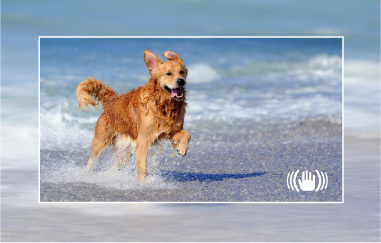 Everio also features a Pet Detection function that detects and tracks the faces of dogs and cats, capturing them with the best setting possible. And it automatically takes stills when they face the camera directly. Have fun decorating while you shoot. Add stamps wherever you touch. 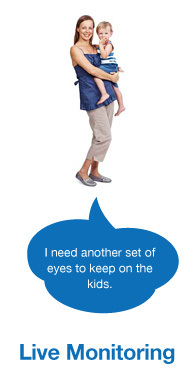 Or spice up faces with decorations that automatically position themselves correctly. You can even add hand-written titles and captions using a stylus pen as part of the recording too. Equipped on the selected models, this LED light automatically turns on whenever the scene is too dark for video recording or still photography. 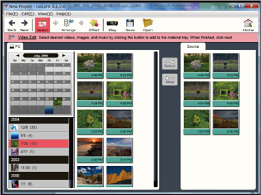 All Everio models come with full-fledged PC software that provides everything from viewing, data management, simple video/stills editing, as well as easy sharing functions, within a single application. Microsoft® .NET Framework 3.5sp1 must be installed. 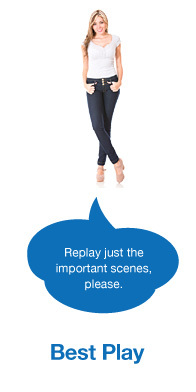 To edit and play back videos, it is recommended to use a PC equipped with Intel® CoreTM i7 (Quad) CPU. To play back AVCHD discs on Windows® XP, UDF2.5 is necessary. AVCHD Progressive Videos cannot be edited. It should be noted that it may be unlawful to re-record pre-recorded tapes, records, or discs without the consent of the owner of copyright in the sound or video recording, broadcast or cable programme and in any literary, dramatic, musical, or artistic work embodied therein. Microsoft® and Windows® are either registered trademarks or trademarks of Microsoft Corporation in the United States and/or other countries. Apple, Final Cut Pro, iMovie, iPad, iPhone, iPod, iPod touch, Mac, Macintosh and the Mac logo are trademarks of Apple Inc., registered in the U.S. and other countries. The "Works with iMovie and Final Cut Pro X" logo, iFrame logo and iFrame symbol are trademarks of Apple Inc. 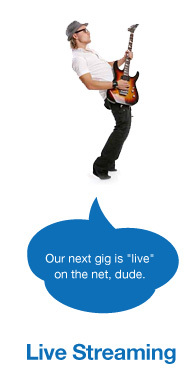 This product's YouTubeTMupload functionality is included under license from YouTube LLC. The presence of YouTubeTM_ upload functionality in this product is not an endorsement or recommendation of the product by YouTube LLC. YouTube and the YouTube logo are trademarks and/or registered trademarks of YouTube LLC. 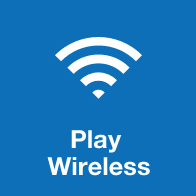 The Wi-Fi Logo is a certification mark of the Wi-Fi Alliance. "AVCHD", the "AVCHD" logo, "AVCHD Progressive" and the "AVCHD Progressive" logo are trademarks of Panasonic Corporation and Sony Corporation. Dolby and the double-D symbol are registered trademarks of Dolby Laboratories. HDMI, the HDMI logo and High-Definition Multimedia Interface are trademarks or registered trademarks of HDMI Licensing LLC. The SD, SDHC, and SDXC logos are trademarks of the SD Card Association. QR Code is registered trademark of DENSO WAVE INCORPORATED. All brand names are trademarks, registered trademarks, or trade names of their respective holders. 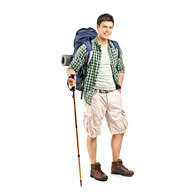 Screen images and print samples on this website are simulated unless otherwise specified. 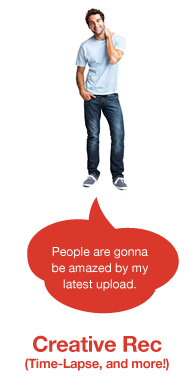 Copyright © 2013 JVCKENWOOD Corporation.